This is who we are and what we stand for. 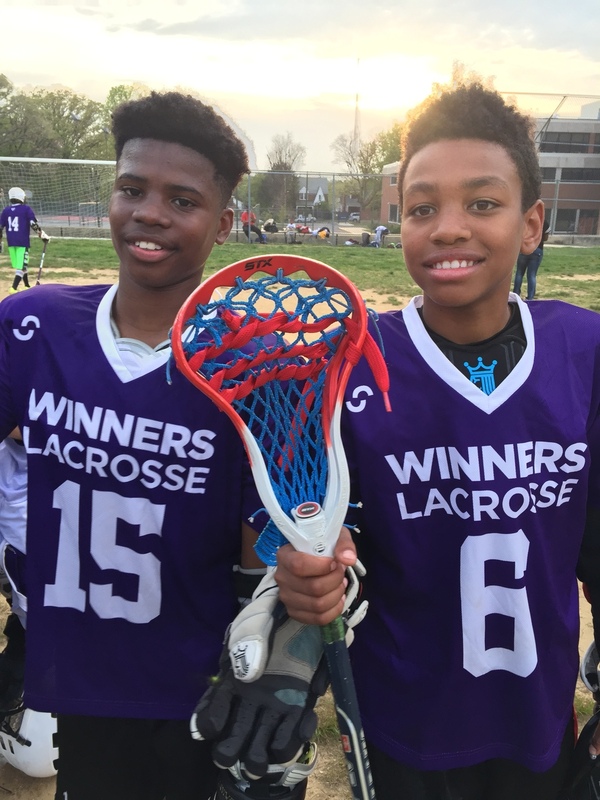 WINNERS Lacrosse is a 501(c)3 nonprofit organization that was started in October 2000 to provide Washington, DC boys and girls, from underserved neighborhoods, the opportunity to learn the game of lacrosse and the life skills associated with playing a team sport. Thanks to our generous donors and sponsors, we are able to provide all equipment and programming completely free to our participants! At WINNERS Lacrosse we believe that sports change lives. WINNERS Lacrosse uses the game as the vehicle to instill values, education and life sustaining skills that will give young boys and girls the tools to be successful on and off the field. Our clinics, camps, teams and after school programs include these virtues as part of the curriculum. For more than a decade, lacrosse has been one of the fastest growing team sports in the country and that trend continued last year. In the last 5 years, boys' and girls' high school lacrosse have each grown by just under 30% (no other sport has grown by over 11%). Over the last 5 years, lacrosse is also by far the fastest growing sport at the NCAA level. 42 new programs began play in 2015 (in 21 different states), with a 5% increase in total players. From 2014-2016, a total of 115 lacrosse programs have started across the country. In 2015, over 800,000 players participated in lacrosse on organized teams, an increase of 2.2% from 2014. More than half of the total players compete at the youth level (age 15 and below), but every segment of the game is showing continued growth patterns. 2015 marked the 12th consecutive year that the net increase of players was over 20,000. Beyond the sheer participation numbers, lacrosse continues to grow in terms of exposure. CBS College Sports, ESPN, Fox Sports, the Big Ten Network, PAC12 Network, and the SEC Network are now all carrying lacrosse packages. Lacrosse combines skills used in soccer, football, baseball/softball, basketball, track & field, hockey, and almost every sport out there into one fast-paced, high scoring game. Want to know the latest WINNERS info? Check out our blog and follow us on Facebook, Twitter, Instagram, or Snapchat (@winnerslax)! Since our inception in 2000, WINNERS has introduced the game of lacrosse to over 10,000 inner city DC youth. We are looking forward to reaching over 10,000 boys and girls in 2019!! We can do it with your help!! Our coaches serve as mentors for all WINNERS players. Through positive coaching and mentoring, we teach our boys and girls about teamwork, leadership, responsibility, accountability, respect, and confidence; traits they take home and into the classroom. We use the acronym MASTERS to show the important characteristics children develop being a part of WINNERS programs. Having a great mentality can lead to huge successes on and off the field. With the right attitude, kids are able to achieve anything they set their mind to. We teach kids in our program to always work hard, and never give up. During this segment, we introduce various concepts like meditation and goal setting! At WINNERS, we emphasize living a healthy and balanced lifestyle. We preach the importance of taking care of one’s body with proper nutrition, hydration, sleep, and taking time away from technology (we all know it’s hard for kids to really be present)! Nutrition specialists will commonly come to programs and teach nutrition in a way that excites our players to properly fuel their bodies! Winning or losing is not the ultimate marker of success or failure to WINNERS. WINNERS kids understand that there’s more to games than the score. Taking responsibility is one of the most important pieces to success. We want our kids to own their mistakes, and learn how to recover from them. WINNERS programs stress to our kids that their success is based on how much they put into it. Practice and game attendance is paramount. On both sides of the lacrosse field, communication is key to putting the ball in the back of net or making a defensive stop. At WINNERS we inform kids on every step of the communication process, from introduction to goodbye. Not only is the ability to communicate taught, but listening is also an integral part of successful communication. Respect is the most important component to our MASTERS success. WINNERS kids are expected to respect their teammates, opponents, and coaches. The respect learned on the field will be translated into all aspects of human interaction, from the classroom to the home and everywhere in between. In WINNERS programs and life in general there is always something to smile about! Lacrosse is FUN...mistakes happen, it’s okay, smile anyway! It is the job of our awesome coaches to implement all aspects of our MASTERS elements to ensure success on and off the lacrosse field. Finally, we would not be able able to do what we do without the help of our generous donors and volunteers!